This past fall, I did a little redecorating. I always seem to get a little bit homebody-ish when the weather cools down, even though the "doesn't really count as cold" 70-degree October we had wasn't exactly cozy nesting weather. Ahem. The towering stack of board games in the corner of our living room was stressing me out. Left photo: towering stack of games. Kind of impossible to get one without knocking them all down. Now I feel like I need something to fill that space, like a 3rd picture or something. Once I'd moved everything out of the corner, though, it needed a place to live. I purchased two of my favorite IKEA storage shelves, and loaded them up in the corner, perpendicular to each other. The little brown wooden table sits in the corner space between them, holding our wooden Settlers of Catan board and puzzle mat (we are very cool), and probably a fair amount of dust as well. One of these days, I may find a lamp that fits nicely in that corner, but alas, not yet. also meant more room in the corner. This new layout also meant that there was finally a spot for the "bubble hockey" game to live, and now we also store the Fisher Price hockey game (this one) on top of that. 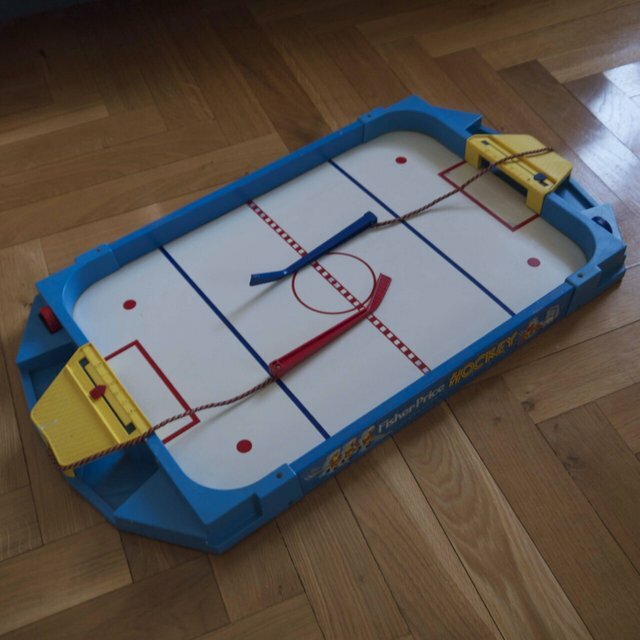 Both childhood hockey games in one place, where they're easy to take down and use, but otherwise out of the way. These photos were taken in October, and things have changed up a bit since then. The stack of games next to the plant is gone, replaced by a hammered "gold" bowl (Nate Berkus, Target) and a small wooden elephant (souvenir from our trip to Thailand - did I mention we went to Thailand? ), which makes the space look purposeful and planned. And we have a rug. A RUG! I'll have to do a Part 2 of this post to showcase the elephant and the rug. They're that awesome.